The Access to Justice theme, based on the Canadian Charter of Rights and Freedoms, and enables people from different backgrounds equality before the law. This fairness extends to all ethnic groups, gender and age groups. The notion of removing barriers is central to the understanding of this artwork. The sculpture is made from a combination of polished stainless steel and Corten steel. The polished stainless steel reflects the architectural surroundings as well as the colour and vibrancy of the busy everyday activity. The stainless steel is also a metaphor for renewal and optimism. The Corten steel is a sealed rust coloured surface, which is a metaphor for the past, as well as industry representing notions of human endeavour. The conjoining of the two metals creates a bridge between the old and the new. Normally, these flat plane surfaces would be read as a barrier or obstacle, except this structure has gateway apertures that allow the viewer to pass through a series of portals: a metaphor for doorways to the Justice system. This physical and conceptual barrier is resonant of a series of rules that intersect at different points, with doorways that facilitate access through the space. The apertures are disability aware to facilitate interaction for all users, and are non-discriminatory. The sculpture is characterised by a series of gateways, at different heights, for all sorts of people. 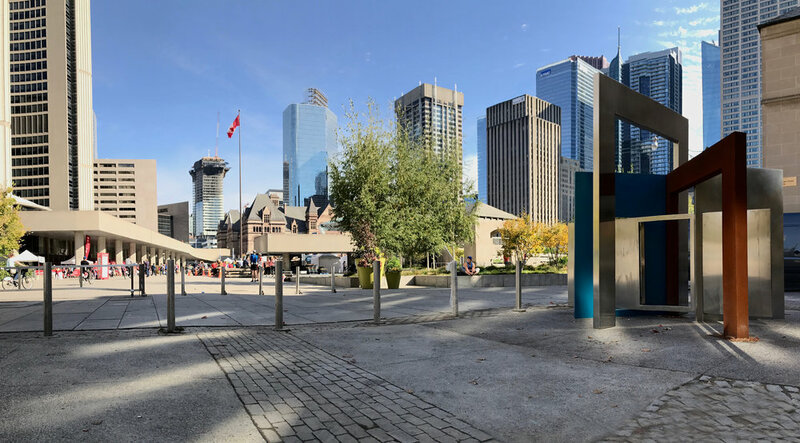 Crucially, from whatever angle you approach the sculpture from, the viewer will have a vista onto the Law Courts: a clear sightline from their own perspective, through the sculpture and onto the buildings that enshrine the justice system. Stainless steel and Corten steel are virtually maintenance free and I have tested the combination of these metals in a variety of environments throughout the world. These materials are durable and can withstand extremes of temperature, with the added value of Corten steel oxidizing to a bespoke hue of red depending on the atmospheric conditions it is placed in. The stainless-steel surfaces capture the reflections of all nationalities into the architectural planes of the artwork: thereby equal under the law and empowering all nationalities access to the law. The use of colour in this concept is also important as it has metaphors to users and to the Canadian landscape, which is punctuated by vistas of the Great Lakes. Access to Justice outside the Law Society of Upper Canada: Toronto. After four years of much dialogue and deliberation the day finally arrives when my sculpture Access to Justice is installed outside of the Law Society of Upper Canada, Toronto. Access to Justice, 2017: 1:12 scale model. Mixed Media.